Full Fact-Find Analysis with Email Support for 9 October 2019 exam available to pre-order today with discount! Email support for 1 working day before the exam (9am-5pm). Comes with our analysis guarantee. Why not try before you buy? Simply enter your name and email address below. You will then receive your free taster fact-find analysis from an earlier exam sitting. This will allow you to see exactly what you will get with the full fact-find analysis when it is released. You will also receive our free newsletter via email. Simply click on the ‘Add To Cart’ button below to purchase the full fact-find analysis and email support package. Then proceed through the order process. You will receive an email with information regarding email support and access to the full analysis from the previous exam sitting, and on the release date you will receive an email with the download link for the full fact-find analysis. Price goes up on the release date (10 calendar days prior to the exam) to £97 (Inc VAT). When you purchase our full Fact-Find Analysis package, we will also provide 1 working day of email support scheduled during the few days before the exam. Full information including the support date and support email address will be emailed to you when you make your purchase. What is the purpose of the email support day? The purpose of the email support day is to answer specific questions relating to the exam paper and our analysis of the paper. Whilst we are confident that the fact-find analysis will help you to pass your AF5 exam; if you don’t pass we will provide you with our analysis for the next exam sitting with a guaranteed 50% discount! What are your pass rates? * After the release of results for each exam sitting, we email all our customers who purchased our analysis asking them about their results. We then collate the pass / fail responses and use these to calculate our pass rate for each exam sitting and therefore the average pass rate over the last 4 sittings. Note that our pass rate is based on the feedback from those customers who respond to our email. I found the Brand Financial Training R06 analysis extremely useful when preparing for my exam and passed with 76%, which I’m not sure I would have gotten without your material. The most helpful aspect was identifying the sequence of questions that are likely to be asked in the exam. This allowed me to focus on ‘core areas’ to secure the bulk of the marks. This is questions like ‘detail the additional information required’ and the generic questioning. "I am pleased to say I passed AF5 using Brand's AF5 Fact-Find Analysis. I am now preparing my application for Chartered Status! I have used the Brand materials for a number of the exams along the way and have found them to be most useful and very reasonably priced and always recommend them to colleagues." "Pleased to say I passed R06 comfortably. I used a range of resources to help prepare me for this and yours was by far the most comprehensive. Thank you so much for the fantastic support and I would recommend your resources to anyone wanting to complete the level 4 diploma that doesn't have the time or inclination to do resits." Brand has helped enormously with the study & learning process. For me, it adds a different dimension to the otherwise dull & drab CII study syllabus. 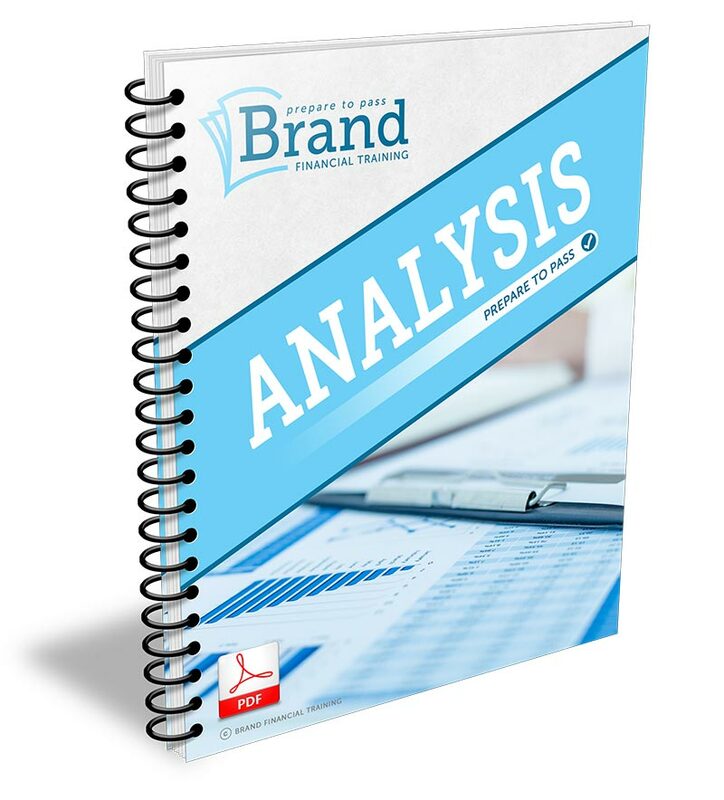 I found the Brand R06 analysis invaluable, as it addressed all the questions that came up in the exam in great depth, meaning that I could focus my revision on specific areas. I would recommend the Brand material to any budding advisor. The fact find analysis for AF5 was first class! Almost every question asked in the exam was covered off in the analysis. Thank you! Why an ‘Analysis’ and not a ‘Solution’? Some providers refer to their analysis of the AF5 fact-find as a ‘solution’. We decided not to call our analysis a ‘solution’ simply because it’s impossible to provide a solution when you don’t know what the exam questions are going to be – and no-one knows that until exam day! We didn’t want to mislead and therefore we decided to call this resource an analysis – our experts tell you what they expect to come up in the exam based on their expert analysis of the fact-find. This analysis provides the likely questions and answers required based on the fact-find. How will the full fact-find analysis of the actual exam paper help me to pass? Passing AF5 isn’t only about having the necessary knowledge and understanding, it’s about being able to apply that knowledge exactly as needed and in a timely manner. It is essential that you have fully prepared for the exam and are ready to answer questions relating to the fact-find. If you go into the exam unprepared, you will lose vital time and marks. Our full fact-find analysis covers the areas that you are likely to see in the exam. However other questions may be asked, and we strongly advise you to think around other potential areas of questioning.